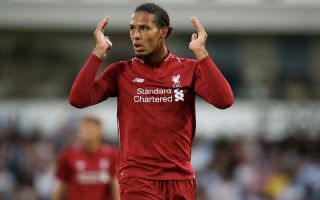 Liverpool centre-back Virgil Van Dijk erupted with rage after his defensive partner Dejan Lovren wasted possession late on against Manchester City. The Citizens secure a 2-1 win at the Etihad Stadium on Thursday evening thanks to goals from Sergio Aguero and Leroy Sane, bringing to an end Liverpool’s unbeaten streak in the Premier League. Roberto Firmino grabbed the Reds’ only goal of the night as they saw their lead at the top of the table reduced to just four points, with 17 matches still to play. Van Dijk’s furious reaction to a sloppy pass from Lovren late on summed up Liverpool’s frustrations, as the Dutchman screamed at his teammate while throwing his hands in the air.